Our most popular rental! 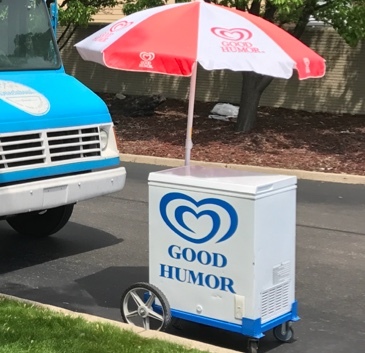 All of our customers say our Ice Cream Cart is the absolute HIT of the party! Do the ice cream carts plug in or use dry ice? You may use either. Most customers choose to plug the carts into an electrical outlet with an extension cord to avoid the hassle handling and maintaining the dry ice. Dry ice is a good option for places where electricity is not available. Will the ice cream remain frozen? Yes the ice cream will remain frozen for days in the cart remains plugged in or stored with dry ice. How long will the dry ice last? A 10lb. block will last about 2 hours. For a typical party, we recommend (2) 10lb. blocks. Can we provide our own ice cream? Yes you may! However, there will be a $25 up-charge for customers who choose to provide their own ice cream.